Public Appearances & EventsScreen captures of Elle attending events such as movie premieres, promotional dinners and award shows through the years. 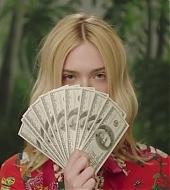 CommercialsCaptures from many of Elle's adorable commercials. PhotoshootsScreen captures of behind the scenes videos of Elle's photo sessions for various magazines. 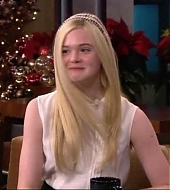 Talk ShowsScreen captures of Elle's appearances on various talk shows. InterviewsScreen captures of Elle's press junkets and red carpet interviews. OthersScreen captures of other types of videos, such as W Magazine's Screen Test, Moviefone's Unscripted and more. There are 12 registered users. The newest registered user is Helena. In total there are 16 visitors online: 0 registered users and 16 guests. Most users ever online: 68 on 08/28/18 at 12:43. Registered users who have been online in the past 10 minutes: .